If you want something cleaner and more reliable than a rock-and-mud swimming hole in your backyard and more permanent than an above-ground pool, there are four main types of in-ground pools. While wood is a possibility, the cost of building one that would not deteriorate in a few years narrows the choices down to the most popular and efficient. Keep in mind that there are variations of the main types, allowing you more options. Here's how it works: after a hole has been excavated in a yard, the sides and bottom of the hole are lined or framed with rebar (steel rods). These can be sculpted into nearly any shape conceivable (from rectangles to boomerangs to hearts and guitars), along with adding steps, ramps, and other features. After the rebar is positioned, the pool shell is made by spraying a finish using shotcrete or gunite. This spray-on method helps a contractor in deciding the size and shape of a concrete pool. In most cases, a pool with modern curves should not cost any more than the same-size pool with a more traditional, angular shape. 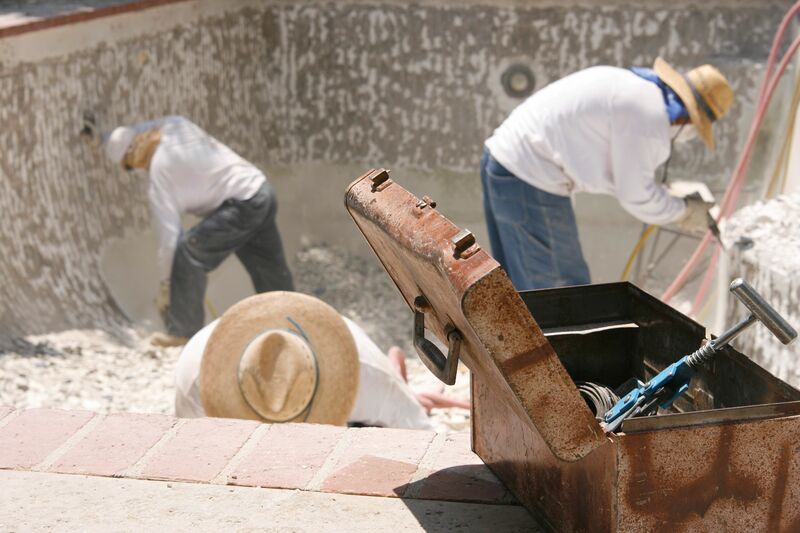 While shotcrete is applied to the pool surface wet or dry, gunite is applied dry. Various materials can be added to pool surfaces made of concrete or plaster, including tile, stone, and human-made textures. Alternative finishes with textures are becoming increasingly popular, like pebble aggregate or (Pebble Tec, a glass alternative Beadcrete, WetEdge’s Primera Stone, NPT’s JewelScapes, StoneScapes, and QuartzScapes). Expect these aggregate finishes to last about 8 to 12 years. Like other materials, vinyl deteriorates with longtime exposure to the elements along with pool chemicals. Some liners come equipped with fungus and UV inhibitors, which can extend the life of a vinyl liner from 10 to about 18 years or so.